I completed a 2nd trade over the past month. This time it was with Matt, a blog reader from Mississippi. Matt and I swapped some 2013 and 2012 Topps cards. 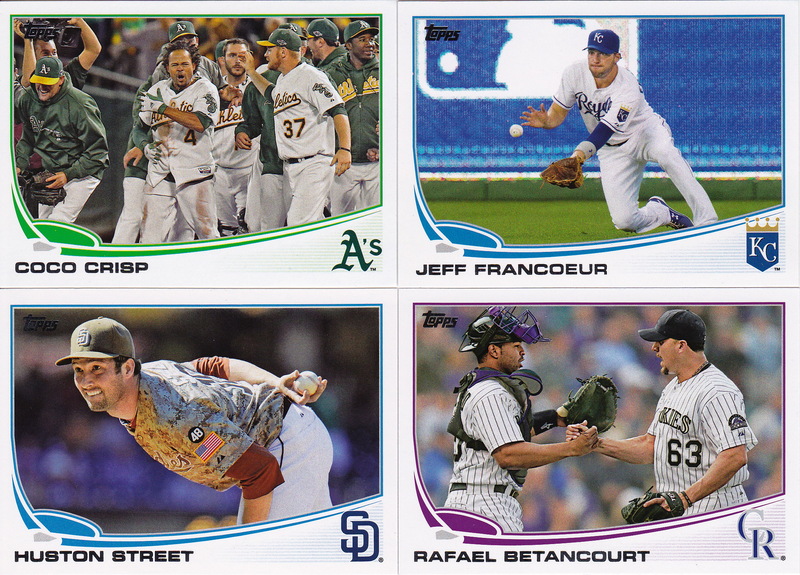 First up, Matt finished off the base set for 2013 for me. He also sent me 3 cards from the 2013 “Cut to the Chase” insert set, which is probably my favorite out of last year’s flagship Topps inserts. 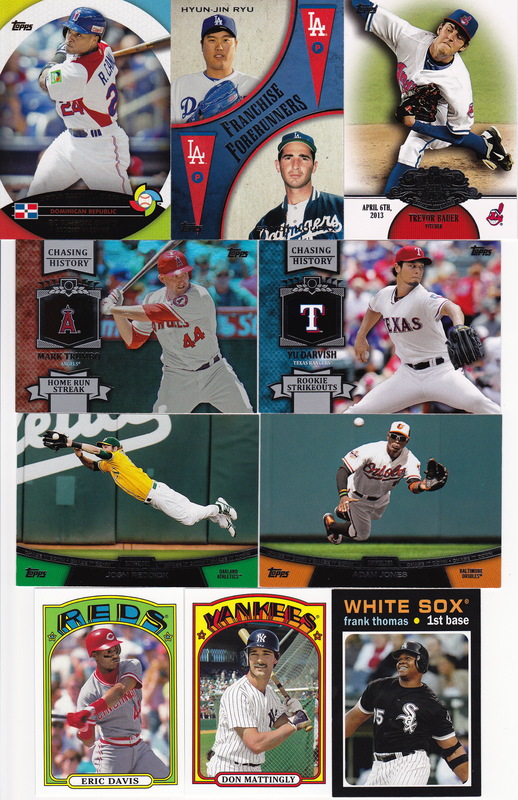 He also sent a bunch of other 2012 inserts, which helped me put a further dent into these Topps insert sets! Starting back up – with a trade post! Some time away can quickly turn into more, and I’m still going to find it fairly difficult to blog at the previous pace I’d established. In other words, I’m not completely back, but a good way to ease back into the swing of things is a quick trade post. I got some cards from at Cardboard Examiner a few weeks ago. It wasn’t anything too crazy – and in fact, I still owe Dean some cards to match up from my end. 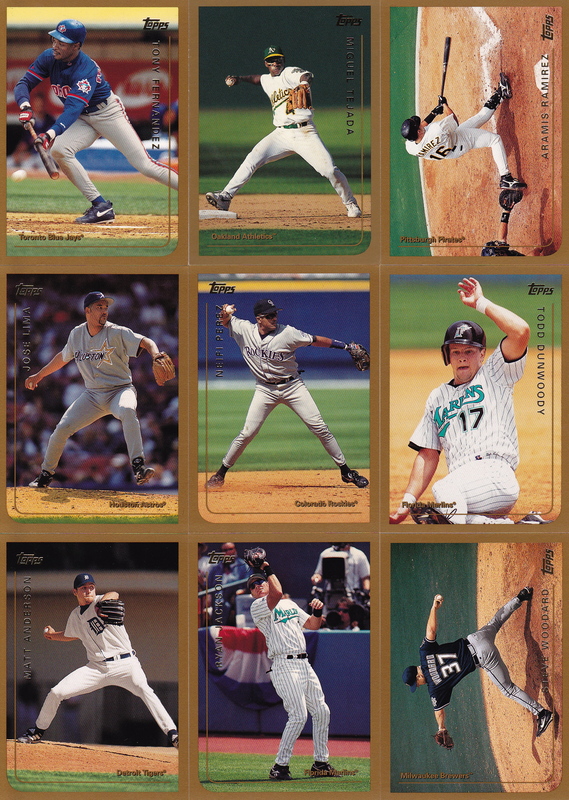 Dean sent me the last 9 cards I needed from 1999 Topps set. That’s another set down! Thanks for the trade Dean! Though the title could suggest it (in a somewhat pretentious way) – this isn’t a post saying “I’m back”. I hope to be back posting regularly in a few weeks or so. But I had an interesting thing show up in my mailbox tonight when I got home, and I thought it was worth a post. Those of you who don’t know basketball cards – or those of you who do know basketball cards but get confused because all of the Panini card sets seem to run together – may recognize that this is from a 2012-2013 card set. I bought this redemption on eBay in very early 2013. I thought it was earlier than that, but I looked it up. 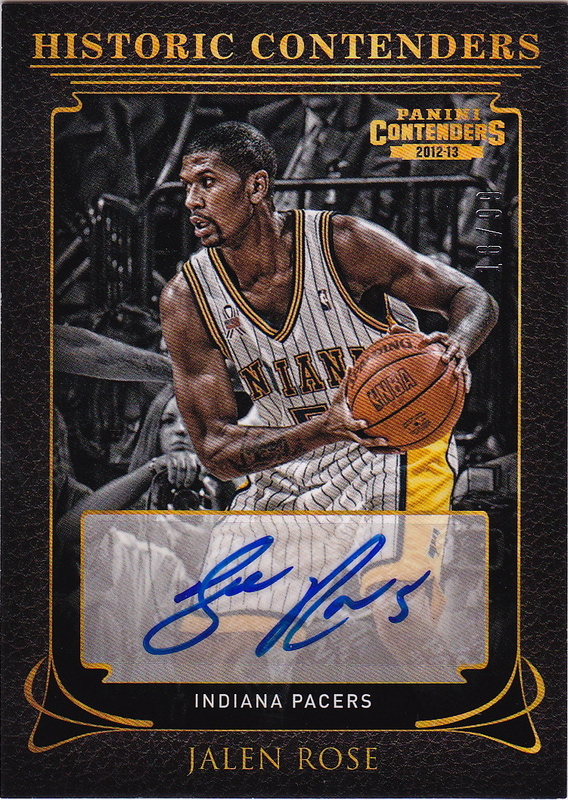 I’ve redeemed 3 Jalen Rose cards from Panini, and they’ve all been quite a while in getting redeemed. I think two of the 3 have been over a year, and I opened up a “Query” on the website for all 3 back in 2013. I’m confused, too – because this is a sticker autograph, and Jalen has had plenty of autographed cards come out in the past few years, so it seems that Panini could have stuck one onto this guy earlier than 1.5 years after the product release. Regardless – I guess it’s good to receive it eventually! 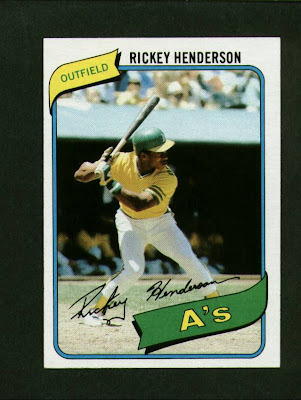 Plus – this is a really nice card. After 4 years of pretty regular posts – I had to put this blog to the side for a little while. This isn’t due to a lack of interest in cards – it’s from a lack of time. Basically, for the past two or so years, I’ve always had plenty of posts in the queue. I think my high water mark was 50 “scheduled” posts. That number slowly dwindled over the past few months, as I’ve unfortunately just been too busy with work. Around the middle of April, when the well ran dry on the “scheduled” posts – I was right in the middle of an extra busy time at work, and kind of decided to just let it ride out for a while. I’ve still been making purchases and am still collecting cards. I just don’t have the time I previously did to blog about them. I did miss the blogging – it’s a fun way to look at your collection. I hope some of that time will return, but I doubt I’ll ever be back to one post a day. Which is fine – I didn’t ever want this to feel like “work”, and I’ve done a good job of keeping it from getting that way. 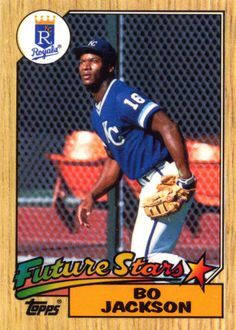 I am going to lessen the amount of new stuff I buy**, in an effort to finish up the sets that I’ve started and also to get further along on the Topps project that was the starting point of this blog. Anyways, I hope at the end of May things will get a little more normal and I can spend some time getting a few posts together. I’ll start off with a trade post and then do a few completed set posts that have been pending for a while. See you then, and thanks for everyone who stops by this little corner of the internet! ** – with the exception of Heritage, which I already bought and thoroughly enjoyed, and hope to post about soon!